Best Seller Publishing announces the release of Dr. Mara Karpel’s new book, “The Passionate Life : Creating Vitality & Joy at Any Age.” It will be available for free download in the Amazon Kindle Store for one more day on September 14th. “The Passionate Life: Creating Vitality and Joy at Every Age” is a guide for all who want to live a more vital, joyful life! After all, Passion, Joy, and Vitality are not just for the young! They are meant for the young at heart no matter what our age. 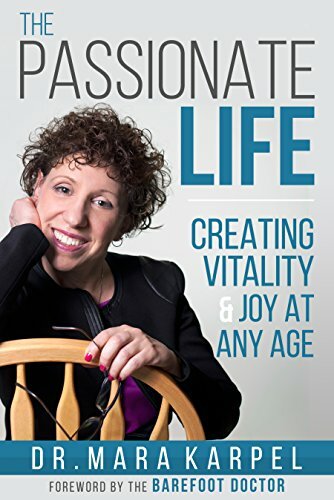 In “The Passionate Life: Creating Vitality and Joy at Every Age,” with the Foreword by The Barefoot Doctor, Dr. Mara interweaves her twenty-six plus years of expertise as a psychologist, her own personal experience, and the wisdom of today’s thought leaders on physical, emotional, and spiritual health into these pages. Readers will gain valuable tips for creating a meaningful, vital, and joyful life––no matter what challenges they may face. “The Passionate Life” is a guidebook for the exciting trek we call “life.” Whether you are early in your journey, moving into a new chapter of life, looking to climb out of a rut, or finding your way again after being lost for years––this book is for you! Dr. Mara shares a wealth of knowledge to help us all feel vital and alive––physically, mentally, intellectually, and spiritually––well into our golden years. “The Passionate Life” by Dr. Mara Karpel will be free and available for download on Amazon for 1 more day (09/14/2018) at: https://www.amazon.com/dp/B07FRQ3T1R. Dr. Mara Karpel has been a practicing clinical psychologist for over twenty-five years, specializing in working with older adults and caregivers, as well as adults of all ages who are dealing with issues of anxiety, depression––or desiring to create more joy in their lives. She also specializes in evaluating veterans for Post Traumatic Stress Disorder. Mara has been the host of “Dr. Mara Karpel & Your Golden Years,” a radio program about the social, emotional, and health issues of older adults, caregivers, Boomers, and all who want to grow older with greater health and more joy, for over 6 years. She is a regular contributor to Huffington Post and to Ariana Huffington’s new online publication, Thrive Global.